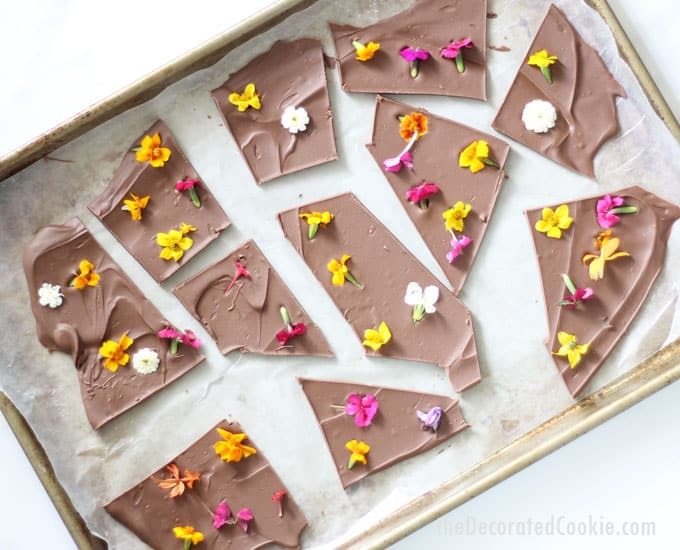 Edible flower chocolate bark is delicious, super-easy to make, and gorgeous. It’s the perfect spring or Easter dessert or Mother’s Day gift idea. You may notice a new trend on my blog. 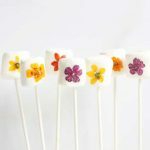 The edible flower-on-sweets trend that is. First, I made these delicious orange cookies with edible flowers. 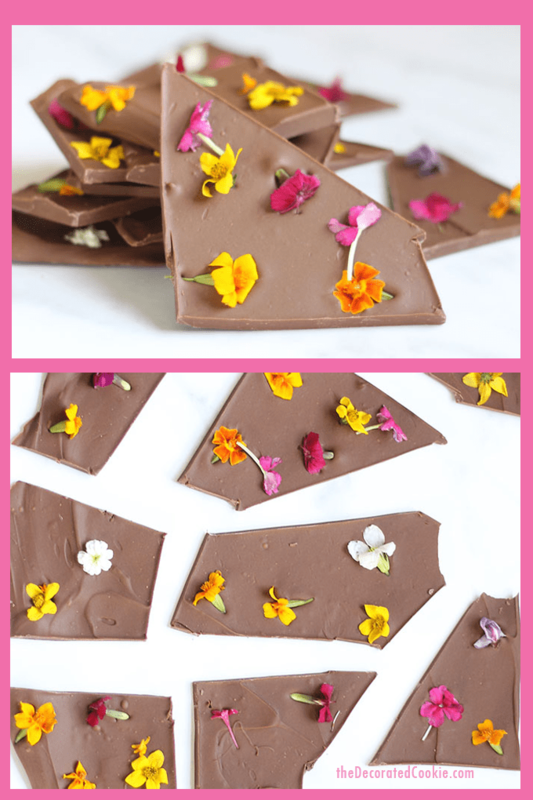 And now… edible flower chocolate bark! (In the interest of full disclosure, I had ordered all those flowers for the cookies, and I wanted to use them up. Hence all the experimenting. 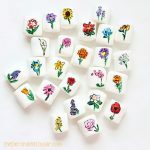 I also made flower marshmallows.) This can’t be easier to make. 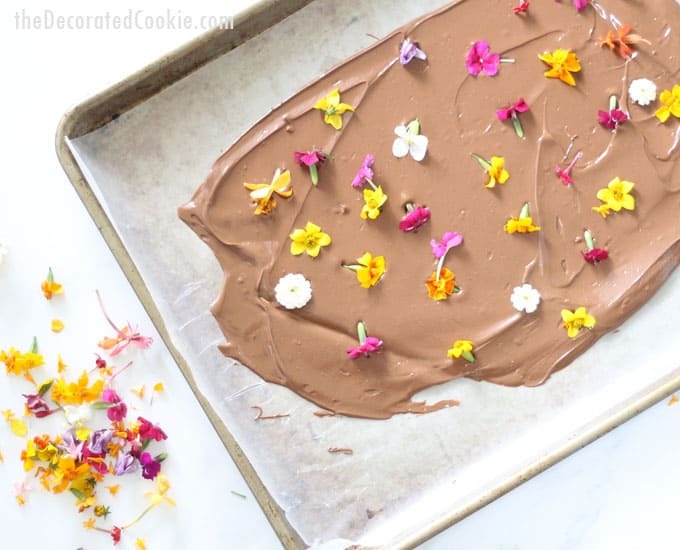 Melt some chocolate, spread it on a tray, and add flowers. If you’re making these for Mother’s Day and need more fun food ideas, check out this roundup of Mother’s Day cupcake ideas. 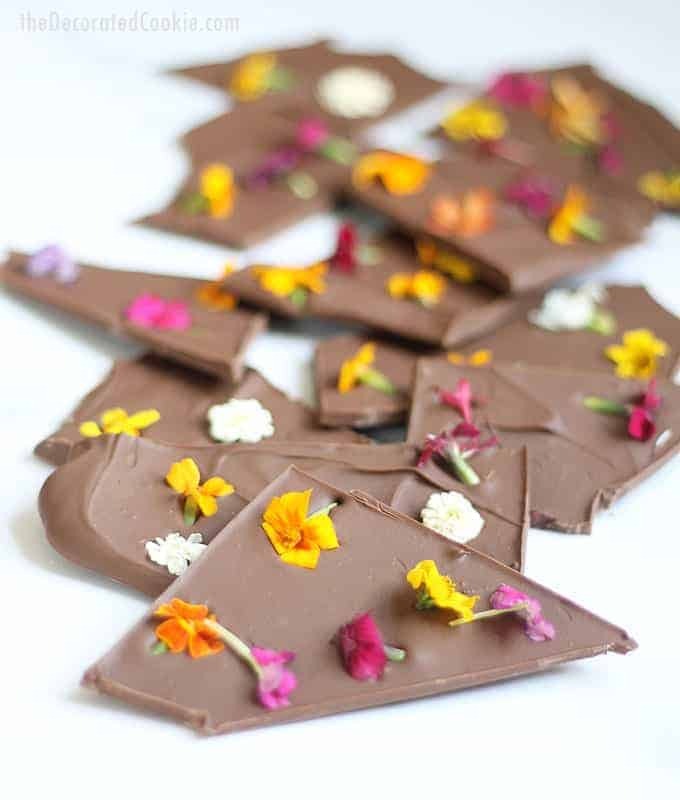 where do you find edible flowers? 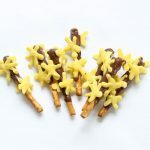 As I mentioned in my cookie post, I found my flowers online. Shipping is expensive, because it’s next-day, but worth it for the quality of flowers you get. Closer to spring, you should be able to find them at natural food stores or even your own supermarket. You can grow and use your own flowers, as long as you, of course, use no pesticides or any harmful chemicals. 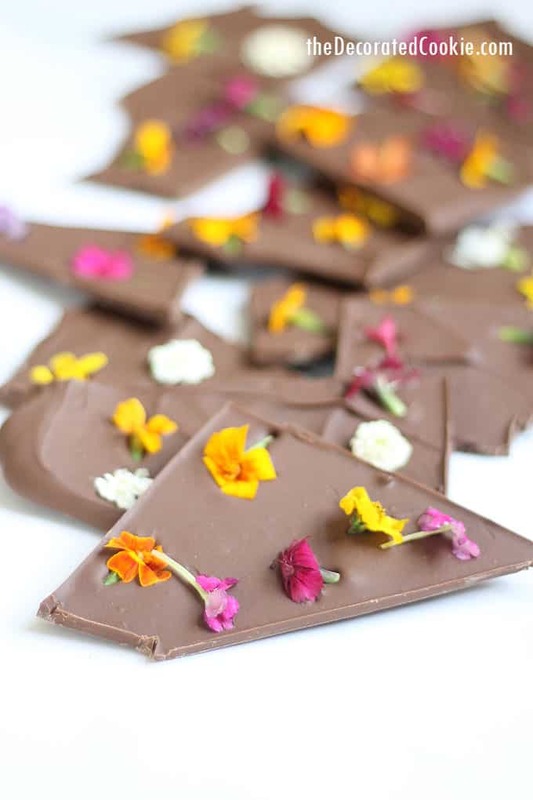 Before choosing flowers to add to your food, do a quick google search to make sure it’s on the edible flowers list and rinse them thoroughly. 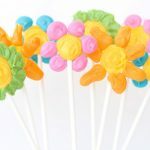 Some popular flowers that are considered edible: Begonia, calendula, carnations, chrysanthemums, cornflower, dandelions, day lilies, gladiolus, hibiscus, honeysuckle, impatiens, lilac, marigold, pansy, primrose, Queen Anne’s lace, roses, scented geraniums, sunflower, and violet. *See paragraph above about edible flowers. Line a baking tray with wax or parchment paper. Melt the chocolate chips according to package directions and pour onto the tray. Spread evenly (you will fill only about three-quarters of the tray). 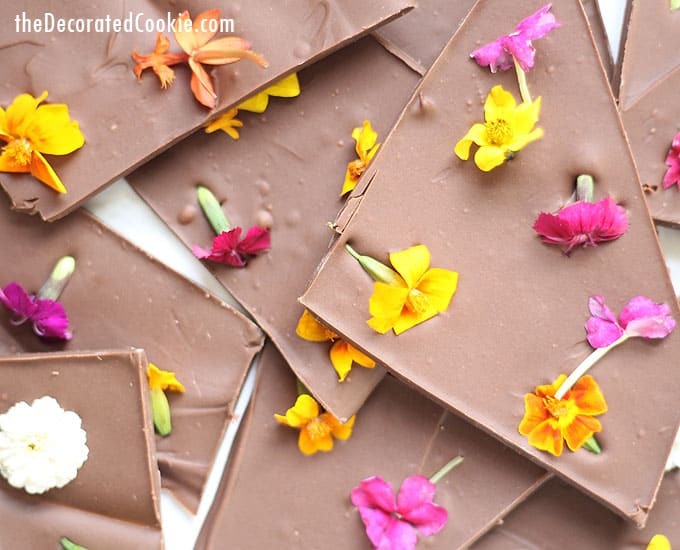 Sprinkle with edible flowers, or, gently place the flowers on the chocolate for more precision. Let the chocolate set in the fridge and break into pieces. 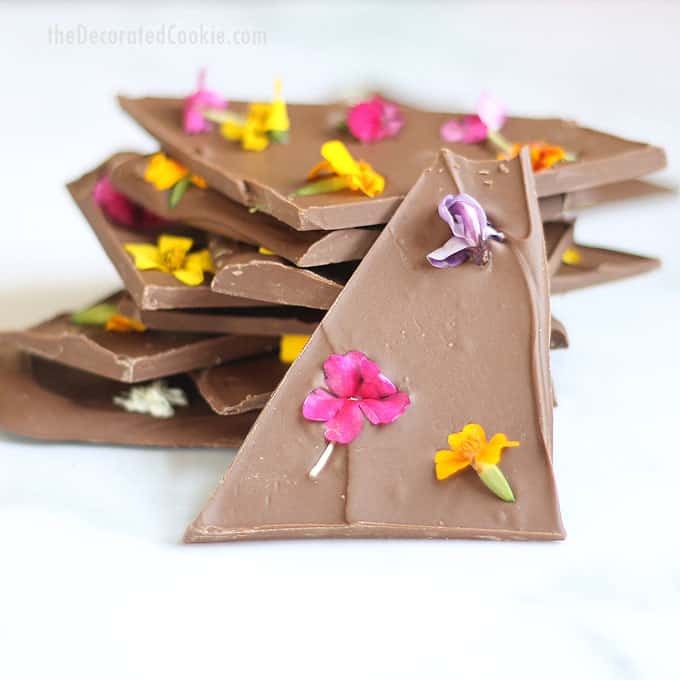 TIP: For more precise cuts around the flowers, let the chocolate set well enough to score with a knife (about 15 minutes in the fridge). Let fully set and break apart where scored. Beautiful! But how long can these be keep in room temperature? Wont the flower turn brown? Hi Min! Somehow this lasted quite a few days. But yes, I wouldn’t go longer than that!